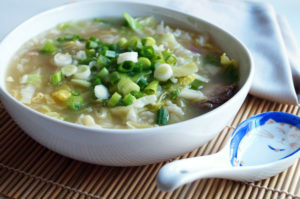 A Congee is a nutritious thick rice soup eaten throughout China that is easy to make and only needs a few ingredients. The amazing benefits of eating this rice soup are increased energy, better digestion, reduced bloating and helps with the absorption of nutrients. Take 1 cup of rice per 5 cups of water. It is better to have too much water rather than too little, so you can add 6 or 7 cups of water. Rinse the rice or grain. On a side note – although rice is the most common grain used other grains can also be used like millet, quinoa or add all the grains together. Also you may use any type of rice including white, brown, red or wild or a mix of all of them. You can also use a stock cube to flavour. Then add any vegetables that you like. Good choices include onions, garlic carrots, squash, peas, cabbage, celery and beans. However only one or two vegetables are necessary. Now cook the rice and veg for a minimum of 30 minutes or until the rice has become soft. 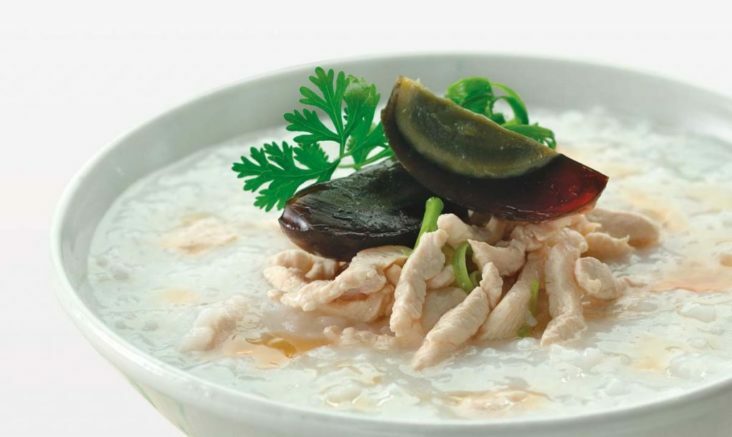 Chinese culture indicates the longer you cook a Congee the more powerful it becomes, so it can be cooked for up to six hours on a low heat. Just make sure that all the water has not evaporated. Once it has cooked season with salt and pepper and serve. Do not drain the water as this is the important part of the Congee. Other variations include adding meat or fish to the pot. A piece of cod or other fish can be easily added for flavour and nutrition. This meal is so easy to prepare and yet has some great benefits. I always make a Congee when I need a quick pick me up or feel below par, as it instantly increases my energy and focus. To find out how you can improve your energy and health then please contact me. Is Acupuncture A Good Alternative To Antibiotics? Richard from Bournemouth Acupuncture explains how acupuncture can be used as a alternative to antibiotics. On the 13th October 2017 England’s chief medical officer Dame Sally Davies, issued a call to action, warning that if antibiotics lose their effectiveness it will spell “the end of modern medicine”. In recent times antibiotics are have been greatly over prescribed. 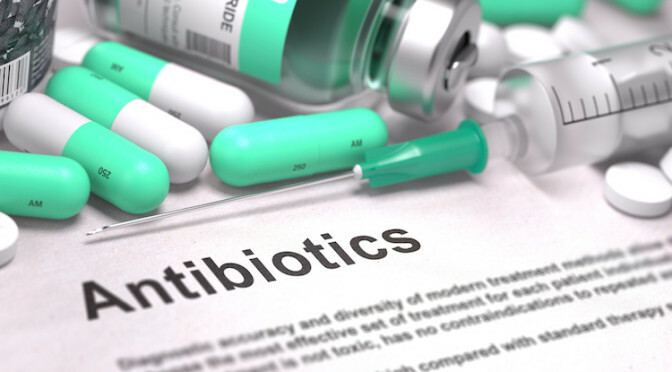 Patients are given little time with their doctors and generally ask for antibiotics for their virus, before exploring other options or assessing whether they actually need them. In turn it is a doctor’s duty to help the patient and give them something to help their situation. Many pharmacist have stated that the use of antibiotics for common colds is normally unnecessary and there are other medicines that can work just as well. 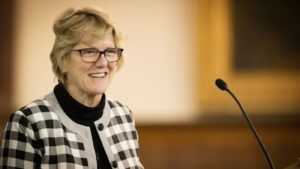 Dame Sally Davies has warned of a post-antibiotic apocalypse, if new antibiotics are not found. It is not just doctors who prescribe antibiotics. In modern agriculture antibiotics are widely used to treat herds of animals. This is a standard practice and often strong antibiotics can be used to treat the sick animal and then given to the whole herd to prevent the virus spreading. Once inside the animal they will be passed onto humans via consuming meat and dairy produce. As a acupuncturist i see and treat many types of infection. A recent example was a patient who was suffering with a tooth infection. He had been taking antibiotics for two weeks but still had the infection. He came to see me and after one session his tooth stopped hurting and the infection cleared up. Some other common cases i see are bladder infections, ear infections, infected wounds or bites, gastroenteritis, bugs, viruses, common colds, chest infections, coughs etc. Fighting simple viruses like a common cold without antibiotics is generally better for you in the long run, as your immune system will become stronger and more resistant to colds in the future. Revitalise yourself with a yoga retreat in Beaulieu on Saturday 28th April. Richard Newman began his career working as a Acupuncturist onboard luxury cruise ships. He was able to introduce the amazing effects of Acupuncture to thousands of people from all over the world. Richard has trained with Dr. Tan one of the worlds best Acupuncturist. Since returning to his home town in Bournemouth, Richard has been successfully using a unique style of Acupuncture to change the life's of his patients. How Effective Is Acupuncture For Headaches And Stress?